The neighborhoods surrounding the Tel Aviv Central Bus Station host large migrant populations. Note: Earlier this year, writer Diane Handal visited Israel to report on what migrants endure to reach this Promised Land. What follows are some random impressions of her journey as a traveler herself, experiencing anew the sights and sounds of a land she knows well. I boarded the flight to Tel Aviv in a plane filled with men wearing tall black hats and sporting beards, women in wigs and kerchiefs — many of them carrying babies — with toddlers running in front and older ones trailing behind. Everyone was speaking Hebrew except for a group of older women tourists from Oregon on their way to visit the Holy Land. We arrived in Tel Aviv’s Ben Gurion Airport and after being grilled at immigration, I picked up my baggage and boarded a shuttle to Jerusalem. The settlements had grown so much from my last visit here, making my heart sink. The scars of the recent uprising and killings lay like a dark blanket over its residents. Hotels have been shuttered as the pilgrims had stopped coming and now there is an uneasy quiet in the streets and a definite police presence. I walked in through the New Gate and rang the bell of Sami el-Yousef, my dear friend and CNEWA’s regional director for Palestine and Israel. He gave me a warm welcoming hug. I had come home again to the place I love and where I feel I belong. I am 100 percent Palestinian, with my entire family from Bethlehem. The following day, I met the Rev. David Neuhaus, who is collaborating with CNEWA to help Hebrew-speaking migrants. I walked with him to Our Lady Woman of Valor Pastoral Center. The children came running up to him, hugging him. The women who worked there were bowing and bending their heads to his hand in a traditional gesture of blessing. He grabbed one child and flipped her upside down! She laughed. My heart stopped. Lots of hula-hoops were spinning in the playground. Inside the tent, children were drawing with magic markers, their finished work hanging on a clothesline. Snacks and juice were being served and as the clock struck 4 pm, Father David pushed them all inside the tent to maintain quiet as the synagogue began services next door. Soon, I met two single mothers from the Philippines who are raising their children in Israel and use the center for after school activities. And then there was Faith. She is ten years old, and is taking care of her five-year-old brother who has Down Syndrome. He doesn’t talk, she says. (But he does communicate; he screams.) Their mother cleans houses. Faith is just precious. I drove with Father David the next day to southern Tel Aviv and saw houses of corrugated metal roofs and siding to shield its residents from this nasty cold weather. They buildings are “graced” by an old bus station where big green buses are constantly coming and going. We were in the slums where most of the migrants lived. A small shopping area below encircled this “Central Bus Station.” On the right side was a Kingdom of Pork Factory store. Graffiti was scribbled on the stone walls of a cement block house with concrete bricks inserted into what were once windows. A dirt lot next door was full of pigeons. We went to Rehovat for Mass with Father David and Tony, a seminarian, who reminds me so much of my brothers. He said when he told his mother he was going into the seminary, she cried for a month! Rehovat is a small town about 12 miles south of Tel Aviv. At last report, in 2014, the population numbered about 129,000 people. Off one of the main streets, we walked into an alley. A small room overflowed with some 50 worshipers, mainly Filipinos, with some international students in the mix, all coming for Mass. A Filipino woman was playing a portable organ and the words to the songs were displayed on a screen to the right of the altar. Everyone was so happy to see Father David, who said the Mass. As before, there were people constantly bowing their heads to his hand. I left Jerusalem, on my way to the Allenby Bridge crossing to Amman, Jordan. On the way, I passed Ma’ale Adumim, an enormous settlement on the West Bank with beautiful paved roads and tall modern street lamps. Its population in 2015 was around 40,000. Soon they will have company. The number of migrants is only expected to grow. According to The Jordan Times, Israel’s defense ministry recently approved plans to build 153 new settler units in the occupied West Bank. 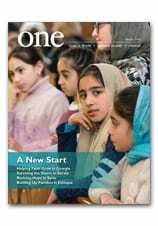 Read more about Surviving Without a Country in the Promised Land in the Summer 2016 edition of ONE.